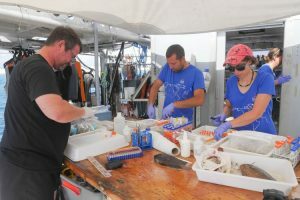 Dr. Alexis PEY, member of THALASSA, participated from July to September 2018 in the TARA Pacific expedition supported and coordinated by the Tara Expeditions Foundation. The mission of this expedition is to study coral reef biodiversity and their evolution in the face of climate change and anthropogenic pressures. This expedition which started 2 years ago allowed the participation of around 70 scientists from 8 different countries. 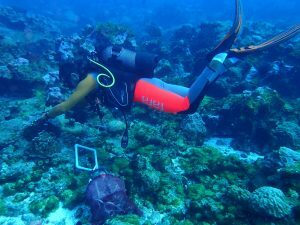 As an expert diver for the collection of data on biomarkers of the stress response of symbiotic cnidarians, Dr. Alexis Pey participated in the coral sampling for the Institute for Research on Cancer and Aging, Nice (IRCAN – CNRS) which is in in charge of the analysis of the state of health of the corals from the visited Pacific archipelagos. Dr. Alexis Pey boarded the TARA Pacific expedition in La Paz (Mexico) for a period of 5 weeks. The study sites were located between La Paz and Cabo San Lucas (Mexico), then around the French atoll of Clipperton-la Passion and finally within the archipelago of Coiba National Park (Panama). Alexis Pey participated in i) the identification of the different target species (Pocillopora meandrina, Porites lobata and Millepora platyphyla), ii) collection of samples according to a specific protocol and iii) preparation of the samples to be send to IRCAN and the 17 other institutions or research laboratories of the TARA Pacific consortium in charge of the analyzes. Clua, E., Aurat, F., Bin, N., Bin, S., Boissin, E., Chavance, Y., Cron, D., Hertau, Elineau, A., M., Lancelot, J., Moro, J-M., Moulin, C., Pey, A., Pogoreutz, C., Pollina, T., Troublé, R., Planes, S. (2018) Mission Tara Pacific sur l’atoll de Clipperton (île de La Passion – France) du 06 au 13 août 2018. Rapport de mission. 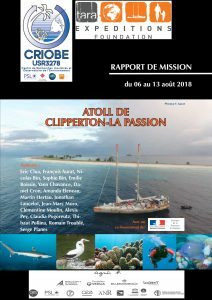 CRIOBE USR3278 CNRS-EPHE-UPVD et TARA PACIFIC. RA272. 72 pp.